Eating giant portions of even the healthiest food can hinder your progress or even make you gain weight. Learn which foods to ration and which foods you can pig out on! Portion control isn't a fad. From the old food pyramid to the revamped food plate, we've long been told that the amount of food we put in our body matters. We know that scarfing an entire bag of even the lowest-carb chip is a nutritional no-no, but when it comes to brown breads, ripe vegetables, and seasonal fruit, we tend to give ourselves permission to chow down buffet style. But new findings from Loyola University suggest that bingeing on healthy food may hinder weight loss. Brooke Schantz, RD, CSSD, outpatient dietitian at Loyola University Medical Center, sees that many of her patients are shocked by the realization that eating whole grains, cutting down on salt, and packing on the fruit isn't a proven formula for weight loss. Weight gain and loss are not as simple as a linear math equation, but those who burn more energy than they take in tend to lose weight. If they consume more energy than they burn, they tend to gain weight. So even if we eat healthy food, too many calories translates into extra weight for most people. Schantz warns, "You need to watch the calories you consume and refrain from eating an excessive amount." This includes "fat-free" or "calorie-free" food. The illusion of a guilt-free treat might be enough to cause you to unintentionally pack on the pounds. When in doubt, measure it out. Says Schantz: "People tend to give themselves the freedom to overeat 'healthy' foods. While the label might say low-fat or fat-free, foods that carry these health claims may be high in sugar and other empty calories. Regardless if it's an apple or a cupcake, you've got to watch your portion size." Most Americans eat more food than what's recommended—except for vegetables. If you're on a healthy diet track, you've probably heard that you need to eat more fruits and vegetables. The problem is, most of us choose fruit instead of vegetables, and we choose to eat way too much. 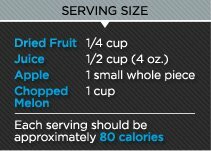 The recommended USDA intake is 2-4 servings of fruit per day. But a serving is much smaller than you think. If you're looking for a nutritional free-for-all, where you can eat to your heart and stomach's content, veg out. Vegetables have more vitamin, minerals, and cancer-fighting agents than fruit. Also, according to Schantz, it's difficult to overeat non-starchy vegetables because of their high water and fiber content. However, she advises you to limit your intake of high-starch vegetables like corn, potatoes, and peas. These veggies act more like pasta and rice on your insulin response and blood glucose levels. If you're looking for variety, go for color. Different colored vegetables bring complementary vitamins and minerals to the table. Yellow and orange veggies are high in vitamins A and B. Green vegetables generally offer vitamins A, C, E, and K.
The caveat however, is that you need to avoid sopping your veggies in creamy sauces, butter, cheese, and dressing. If you transition to the taste of raw vegetables, use training wheels. Start with one tablespoon of dressing per serving, or pair a half cup of raw veggies with a half cup of cooked veggies. You can also try salsa or some lemon or lime juice to dress up your greens. It adds some zing without many calories. Carbohydrates are our main energy source, but even complex carbs can add up. Whether you eat white or whole-wheat noodles, 1/3 cup is a serving. If you pile your plate with carbs, you'll eat more than a third of what is recommended for an entire day in one meal. Not sure how much lean protein is needed to fuel, and not overfill your body? Palm it. About 3-4 ounces of lean meat, a palm-sized portion no bigger than a deck of cards, is all your body needs per meal. Keep in mind: these recommendations are for a general population. You muscle gainers likely want and need larger protein servings. All in all, the amount of food you eat is just as important as what you eat. 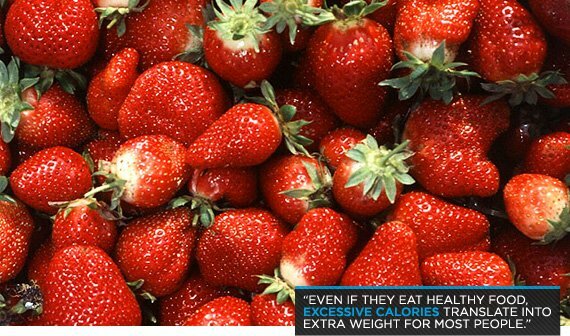 Even if you have a fridge full of lean meat and produce, eating bowlfuls of strawberries before you go to bed probably won't help you lean down. A good rule of thumb: make sure you read the labels, and then adjust the recommended amounts to fit your nutrition needs and fitness or physique goals.